This festival was an amazing experience for me: the sense of community and camaraderie among the artists, the support of the public, plus the chance to be inspired by the work of others while showcasing some of my own. I really feel I may not be able to express the joy this event brought me however I will attempt it… I will try to be succinct. 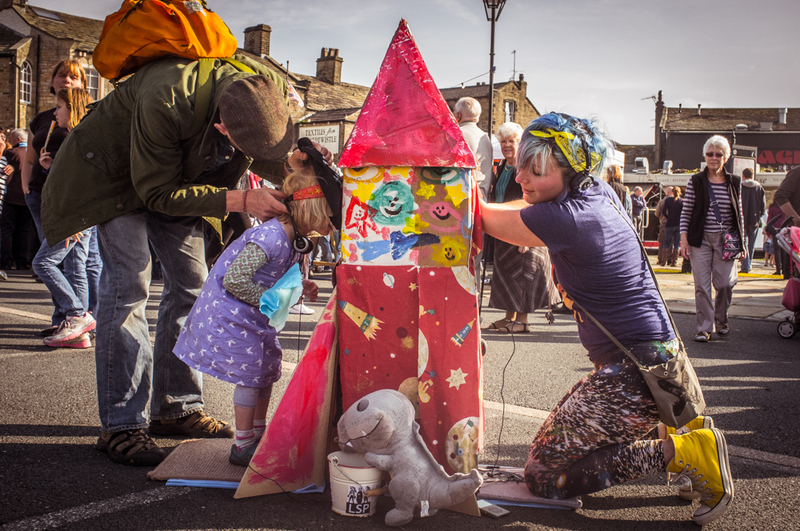 The Skipton Puppet Festival takes place in Skipton, North Yorkshire once every two years on the last weekend of September, bringing together performers from all over the globe. I am currently attending the London School of Puppetry (LSP) and this year I was given the task of managing the schools tent at the Skipton Fest. This, plus developing two shows of my own and rehearsing one group show, made for a very busy month for old Jhess. I won’t talk too much about the weeks leading up to the festival; needless to say they were busy, exhausting and stressful… but also very enjoyable. Nothing brings a family together like festival madness. Festival weekend arrived and the LSP house was packed to the rafters (literally). Where just days earlier there had been about six of us living in the LSP house, there were now around 17! It was like Christmas, where the extended family of LSP came with gifts to share; the gifts being an array of different shows that would be presented at the LSP tent. There were 14 shows in total presented by LSP at this year’s fest, all of which were excellent and… my job to manage. The festival was so incredible; I couldn’t believe how well the whole weekend went. The LSP tent ran like a well-oiled machine, I am so grateful to all our performers and helpers who made this so. We were also incredibly popular, every show was packed and we always had to turn people away. All show’s at the LSP tent were free, and ran for between 5-15 minutes (there was always something on), plus we were right in the middle of the festival hub site so were very visible to anyone walking by. All of our shows went well; audiences were generous with their applause and their donations. We had people coming back for more, and asking when this show or that would play again. I was and am so proud of everyone for their work. I felt very privileged to be surrounded by a group of such talented people (I will have to stop before I start gushing… I LOVE YOU GUYS! whoops, too late). As for my own shows, I was very pleased with how they were received. I performed my solo pieces “Rabbit’s Special Tea” and “Rock It” several times over the weekend, two very different shows, both for young audiences. “Rock It” is a theatre for one shadow show that runs for two and half minutes; this was my first experience performing theatre for one in a festival environment and… Wow! I would set myself up nearby the LSP tent and do about two hours at a time. In that time I would perform endlessly. There was always a queue and I would have to turn people away when it came time to wrap up, needless to say I got very good at my show after performing it hundreds of times. It was so wonderful to hear the responses of the children; despite the headphones I was wearing with the show’s music running, I would often hear giggles and squeals as I performed. Many adults also enjoyed the show. "Rabbit's Special Tea" was also received well; as the show is ninety percent silent, we would open up the tent as to accommodate more people and allow walk ups. The children loved this little character and would interact with him without hesitation. On the final day of the festival, it was very windy and all of Rabbit’s props kept flying off his little stage. The children at the show were fantastic, they would run off and rescue his props and bring them back to him. He would sometimes knock them off on purpose to fits of giggles from the kids. It was an amazing contrast performing to large numbers of people outdoors with Rabbit as opposed to performing to one person at a time inside my little cardboard Rocket. For more about “Rock It” or “Rabbit’s Special Tea” you can scroll down to previous blog posts. Each show had its own special post while in development, prior to the festival. The third show I was involved in was “Bake That!” a group devised piece using the bread puppets created for a promotional shoot we did for charity, “The Real Bread Campaign” (see previous blog post). The rights to the characters/ puppets still belong to their creators, so we decided to develop a fun little show to add to our Skipton program. Basically, the show was a selection of pop songs, parodied with some amazing bread related puns. Some examples included: “Bake me up before you go go”, “All you need it loaf”, “Don’t worry be bappy” etc. This show ran only twice, on day two of the festival and both times received a lot of love. Like Rabbit, it was performed with the tent open and drew huge crowds. Very simple but effective, “Bake That” was a lot of fun… I may sing all of the song’s with the bread pun lyrics for the rest of my days. There is so much more I could say about this experience but I will be writing for days. No-one will read my blog if it is the length of a novel! If you have read this far, thank you, I hope I have not disappointed. Just writing about it I wish I was back there, I was absolutely in my element the entire weekend, performing with puppets, organizing our tent, seeing puppet shows (I didn’t even get a chance to mention the other show’s I saw… They were all amazing!). As I mentioned at the very beginning, the feeling of camaraderie around the Festival was incredible, not only among my LSP family, but all of the artist’s and audiences as well. Even the street vendors were getting into the spirit. There was a hot chocolate stall across from us which I frequented and on the final day the son of the woman running it had made his own little puppet show with a cardboard box and plastic spoons… Best! Photo's will be available in my Gallery soon. The Skipton Fest marked the end of my time at the London School of Puppetry this year; what a send-off! I have learned so much already and can’t wait to get back into it in 2014. Stay tuned for my next installment: Rita the giant mask puppet!